Ferrari has produced fiery sports cars throughout its long history, but the flames have been more literal than figurative as of late. 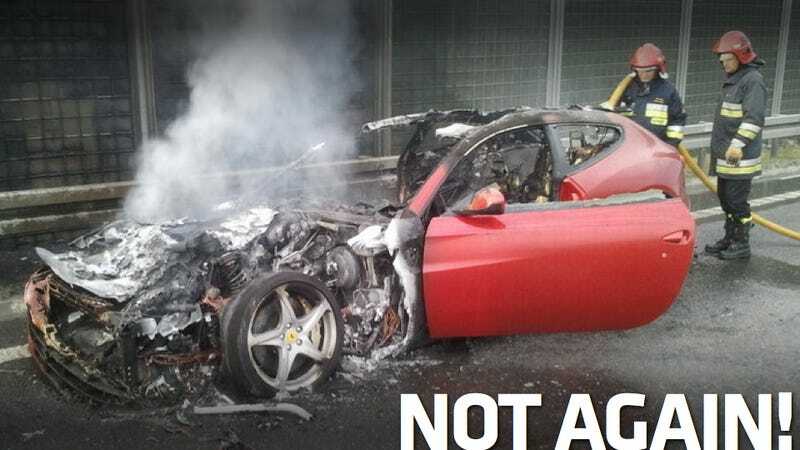 The latest in a spate of ferrar-b-ques burned on a Polish highway this week, destroying a $430,000 FF coupe. According to Polish news station Kontakt24, an eyewitness spoke with the driver, who said that the fire started inside the car, near the pedals. The circumstances of this fire were different from the FF that burned in Germany late last year. A potential buyer had taken that one out for a test drive when she heard a loud noise before the fire started. Another FF burned in China in February. Most recent Ferrari fires have been 458 Italias. The model was recalled in 2010 for what Ferrari said was an adhesive that had a propensity to catch fire in certain conditions. Sure. I have a roll of duct tape that will catch fire if you put it in a burning Ferrari.